Westbourne Park Road is a street in Notting Hill. This part of the Ladbroke estate was the last to be developed. In 1847, a convent of the Poor Clares was established at the south-western end of what is now Westbourne Park Road, in its own large walled garden. 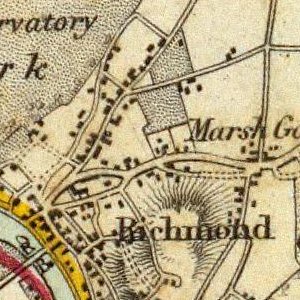 At the time, the site was described by the journal Building News as a ‘dreary waste of mud and stunted trees’, apart from ‘a melancholy half-built church’ (All Saints in Talbot Road) and ‘a lonely public house’ (the Elgin). According to the paper, a number of ‘low Irish’ had settled nearby and there had been ‘a plentiful crop of Romish conversions there’. For more than a decade, the convent and the pub remained alone. It was a period of financial crisis for developers, and it was not until the early 1860s that any other buildings were erected. The first houses to be built on the southern side (apart from the convent) were Nos. 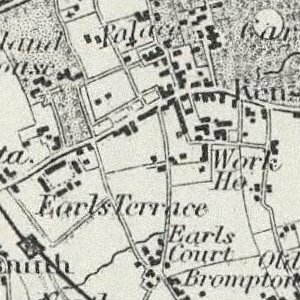 305-317 (odds), dating from around 1860, as the 1861 census records three occupied houses next to the Castle pub, and four of the seven are already shown on the 1863 Ordnance Survey map. The map shows no front gardens or front areas, and they were clearly built to have shopfronts on their ground floors. The builder was Paul Felthouse, who also built the Castle pub next door. 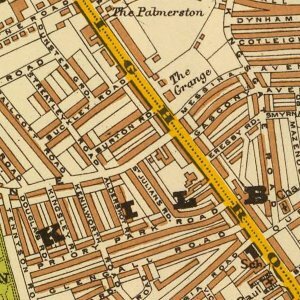 In 1863, a further terrace of residential houses was built on this side, between Kensington Park Road and the convent (175-207 odds Cornwall Road and then Nos. 319-351 odds Westbourne Park Road). This terrace and the convent were demolished in the 1970s to make room for the new Council estate on this side. The northern side consists mainly of one long terrace of half-stucco houses with decorative coursing in the stucco. They all were all built with porches and have either flat or triangular architraves above their first floor windows. They stand three storeys high and have basements and front lightwells, with tiny front gardens. 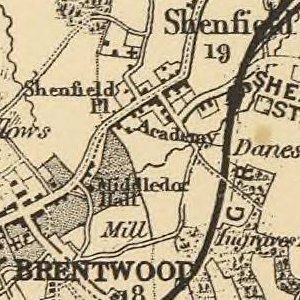 Where there was a public house, the tendency was to start building next to the pub (which often served as a sort of office for the builders) and the first houses to be built on the northern side were the current Nos. 336-352 (evens), the present No. 354 being part of the pub. They appear on the 1863 Ordnance Survey map but not in the 1861 census, and a deed in Kensington Central Library (No. 26094) indicates that they been built around 1860-61. On completion they were let on 99-year leases for ground rents of 7-8 guineas. Between Nos. 316 and 318 there is an archway through to Elgin Mews. This first part of the terrace forms a near symmetrical whole. 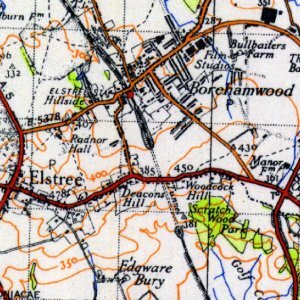 The five houses nearest the pub (Nos. 344-352) and the last four houses (Nos. 316-322) stand slightly forward of the others, as “bookends”. They also have flat topped architraves above their first floor windows (although not all survive), whereas the intervening houses have triangular ones (although again most are missing). The rest of the terrace (Nos. 282-320) was probably built shortly afterwards. This was from the beginning a much less prosperous area than the streets further south. Already by 1871, most of the houses were accommodating two or three households and there were very few live-in servants. 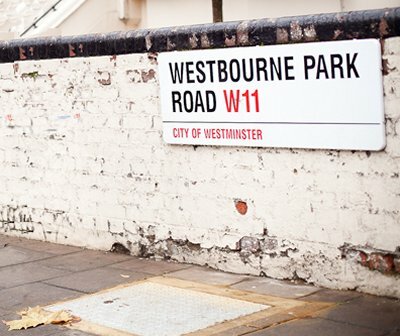 Westbourne Park was originally, with Westbourne Green, an area simply known as Westbourne. Westbourne Green was, with Paddington Green, one of the area's earliest settlements. A growing residential area lay to the west of Westbourne Green. For a short while known as Westbournia, when this part of London was developed, Westbourne Park became the name given to the area. 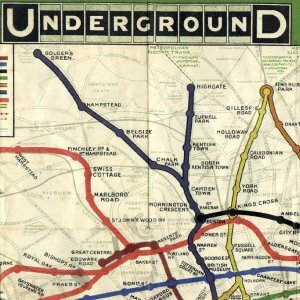 This is reflected in a number of street names - notably Westbourne Park Road and in the Underground station. The first station operated from 1866 to 1871. 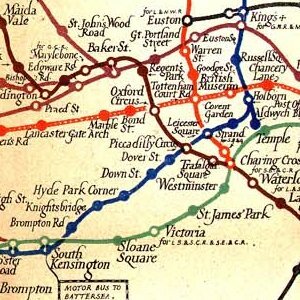 In 1871 it was replaced by another station further east. The good transport encouraged many to move into this area. To the north and east there were extensive railway yards. More recently there is also a Westbourne Park bus garage, built where there once were railway yards, just northeast of the underground station. The name Westbourne (which means 'west of the river') was by the nineteenth century applied to the river itself (previously called the Bays Water amongst other names).